COS® Paper Clips. Slide on to hold your loose papers together without punching or stapling. 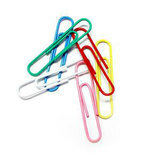 33mm coloured vinyl covered clips add colour to your documents. Pkt of 100.